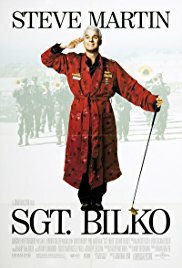 Brief Synopsis – A motor pool sergeant who knows how to work the military system very well tries to find a way to keep the Army from closing don the base due to inefficiencies. My Take on it – This is another film that I heard about when it came out but never got around to checking it out to see what it was all about. Having always been a fan of Steve Martin and his comedic talents, I was quite curious to see what he would be able to do with this role. Martin is definitely the standout here among the whole cast and this role truly is the right one to highlight his comedic talents. The story of this film, on the other hand, is unfortunately quiet lacking because it’s quite silly and very inconsistent. They manage to have a bunch of funny scenes that feel like short skits but the idea of stringing together so many skits to make a mosaic of a 90 minute film just doesn’t work well because it feels too tiresome by the way it is strung together since it lacks a really coherent story. A majority of the characters aren’t developed well enough and it’s extremely hard to care about any of them (or even differentiate between most of them) because they all seem like they are all cut from the same mold. Dan Aykroyd is completely wasted in the role of the base commander and is underused since he is unable to use his comedic talents. Phil Hartman , on the other hand, is perfectly cast as the devious officer trying to prove that everyone else is wrong and who will do all he can to make them all fail. Bottom Line – Fun film that highlights Martin’s talent yet the story itself is quite lacking. There are lots of enjoyable vignettes in this story, but on a whole, things are a bit tiresome because it feels like a marathon of skits instead of a coherent story. Most of the characters aren’t developed well enough and it’;s hard to care (or even keep track) of most of them because they all seem too similar. Aykroyd feels wasted as the commander of the base and doesn’t manage to use his comedic talents enough in the role. Hartman is perfectly cast tho in the role of the devious officer trying to prove everyone wrong.